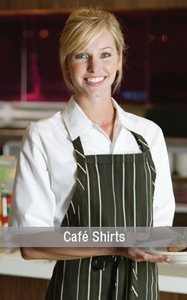 For all your hospitality clothing needs. 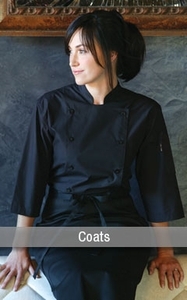 Whether you are a Chef, Cook, Busser, Bartender, Valet or Waiter we have the uniforms for you.We have In-house design and customization both for embroidery and print. We offer affordable top quality Dress Shirts, Banded Collar Shirts, Ties, Vests, Aprons,Polo Shirts ,T-Shirts, Pants, Skirts, Blazers and Suits for both men and women. 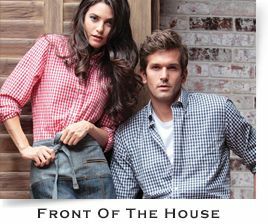 Dress Shirts for Men and Women are offered in a wide range of Colors, Stripes , collars and fabrics. Both pattern ties and solid color ties and vests are available. 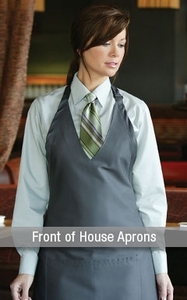 Bib Aprons, Waist Aprons, Bistro Aprons, Tuxedo Aprons and Butcher Aprons are availible in many colors that compliment the Waiters Shirts and Servers ties.